Are you looking for an easy roast that has a phenomenal flavor? 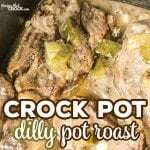 This reader submitted recipe for Dilly Crock Pot Roast is fantastic (and low in carbs)! Mix remaining ingredients in a small bowl and pour on top of roast and cook on med 6-8 hours or till fall apart tender. Sprinkle with the bacon bits (if you fried 3-4 pieces) before serving, I just use the grease I save. This is a reader submitted recipe by Marlene Chandler-- thanks Marlene!! This recipe is low in carbs, however some low carb folks don't like to use cream of mushroom soup. If you don't mind, this is definitely a roast to throw in your low carb menu rotation that even carb lovers will love. As with any of our recipes, carb counts, calories and nutritional information varies greatly depending on which products you choose to use when cooking this dish.